It’s June Dairy Month! We have a number of collections here in the Special Collections Department which relate to dairy, and to name a few those include the Iowa State Dairy Association Records (where you can see the activities and promotional events of past June Dairy Months here in Iowa), various Iowa State University Dairy Science Department Records (under RS 9/11), and the patent for the process of making blue cheese developed here at Iowa State – and adopted by Maytag Blue Cheese (under RS 23/01/03). Iowa State College’s (now University) Iowa Blue Cheese. Photograph taken in 1934. However, this post will highlight a new collection we recently brought into the department, the Arthur Rudnick Papers. Rudnick was a long time educator and leader in Iowa’s dairy industry. He worked at Iowa State as a professor of dairying from 1913 through 1970. During much of his career he served as Iowa State’s extension specialist in dairy manufacturing and developed one of the first dairy manufacturing Extension programs in the country. He retired from the Department of Dairy and Food Industry after more than fifty years of service to the University. In addition to his role as an educator, Rudnick also worked to improve the dairy industry by involving himself in other professional opportunities. He served as a delegate to the 1937 World Dairy Congress held in Berlin, Germany. The World Dairy Congress was held August 22-28th and included over 3,700 delegates from 52 countries. In 1951 Rudnick returned to Europe as a member of a team of farm specialists sent to seek out qualified farm families for immigration to the United States under the Displaced Persons Act. The collection includes a travel diary documenting Rudnick’s 1937 trip to Europe as a delegate to the World Dairy Congress. Rudnick carefully details his trip, even recording the topics of speakers he listened to at the World Dairy Congress. Pasted into the diary are numerous publications he collected on the trip, mostly written in German, about the dairy industry in England, Germany, and other parts of Europe. Also included in the collection is an article (published in 1919 in the Journal of Dairy Science) in which he describes the process of making buttermilk cheese. At that time, Rudnick states, buttermilk was one of the largest creamery by-products and was often an unprofitable product. Rudnick’s diary from 1937 forms the heart of this small collection, and can be a fascinating read about the dairy industry in Europe (mainly Germany and England) in 1937. On page 211 of the diary, in which he describes plants he visited in London on September 14, Rudnick quickly skips from discussing infested milk bottles to pasteurization: “One of the peculiar things is that the housewife does not pretend to send the dairy a clean bottle. We were told that it is not at all uncommon for a plant to receive bottles that had maggots. London has about 90% of its milk pasteurized, the rest is for the most part certified…” In this same entry, Rudnick discusses pasteurizers, aluminum bottle caps, the plant’s production line, and London’s Milk Board. To read more about Rudnick’s 1937 trip, please visit the Special Collections Department. The finding aid for the Arthur W. Rudnick Papers can be found here. 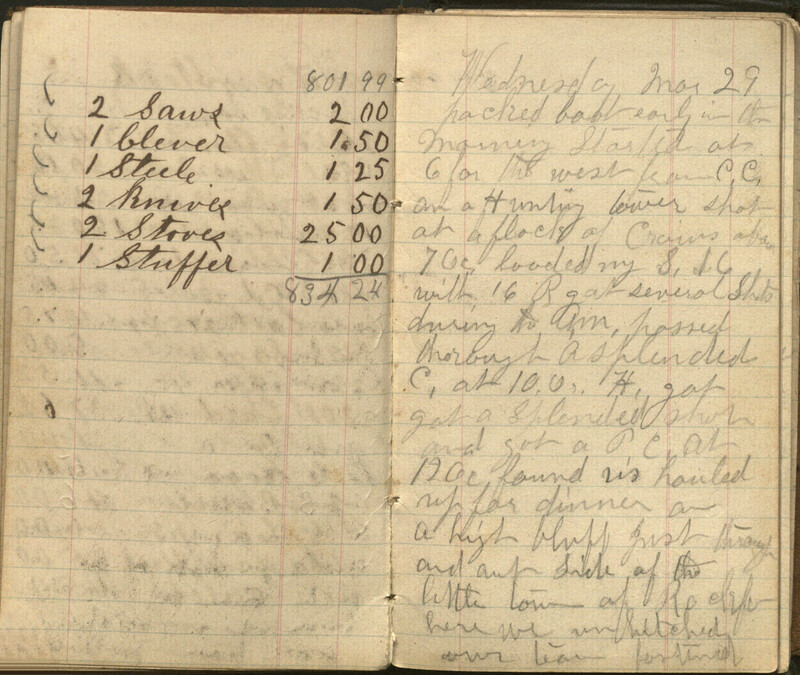 Civil War Diaries Now Online! One hundred and fifty years ago this morning, April 12, 1861, the first shots of the Civil War were fired at Fort Sumter. A year ago Iowa State’s Special Collections Department and Digital Initiatives were excited to announce the launching of our Digital Collections library. A number of collections have been added since then, and in honor of the Civil War’s sesquicentennial commemoration this year, six of our Civil War diaries and reminiscences have been digitized and made available online. The diaries can now be searched by keyword through CONTENTdm, and eventually transcripts and metadata will be added. A news clipping from the L. Stone Hall Diary (MS 587) about James Irva Dungan and his capture and escape from the Confederates. The diaries reveal a variety of experiences of Iowans who participated in the Civil War: Cyrus Bussey, L. Stone Hall, Charles Chapman, James Robertson, John Chambers, and Celestia Barker. Cyrus Bussey details his experiences as an officer with the Iowa Cavalry, his involvement in the Battles of Pea Ridge and Vicksburg, and the occupation of Helena, Arkansas. Bussey’s reminiscence begins with a description of how the Civil War was brought very close to Iowans early on in the conflict: “In July 1861, the rebels under Martin Green and Harris were organizing in North East Missouri. Union men were driven out and much alarm felt by the citizens of the Southern border counties of Iowa.” L. Stone Hall, who served in the Iowa infantry, spent most of the Civil War in the far south, and was a Confederate prisoner at Shreveport, Louisiana. Charles Chapman’s diary contains brief notes concerning daily life as a private. His regiment took part in the Battle of Prairie Grove, Arkansas, and the siege of Vicksburg. James Robertson was taken prisoner at the Battle of Shiloh and hospitalized in Nashville, Tennessee’s University Hospital. John Chambers was stationed in Tennessee, Louisiana and Mississippi. Chambers also took part in the siege of Vicksburg. Cover page from the John Chambers diary (MS 159). 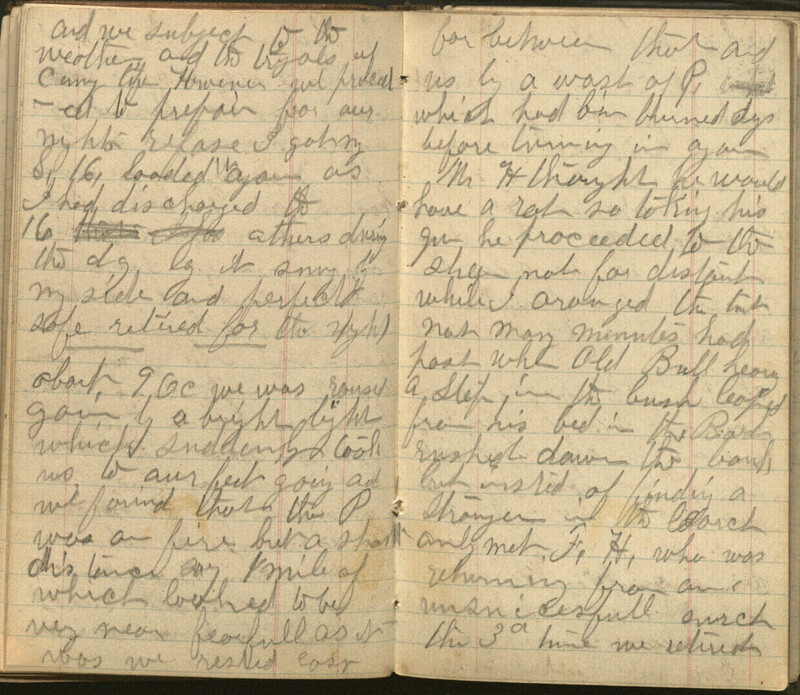 In addition to the soldiers’ diaries described, we also have a diary from the Iowa home front. Celestia Barker’s husband served in the Civil War. Barker describes her work on her family’s farm, social activities, attendance at church meetings, and visits to family throughout central Iowa. Included throughout are reminders of the Civil War. For instance, Barker describes (page 10) a time when she was baking with a friend, and her friend was “in the bread up to her elbows. I had to laugh at a remark she made about killing chickens. She said she hated to kill them and then she would think of our soldiers being killed so unmerciful and then she would be more courageous because the rebels kill the soldiers she spits her spite on the chickens.” The diary primarily contains descriptions of daily life, but is interspersed with descriptions like this which show that that the Civil War was still on the minds of Iowans as they lived their life in Iowa far from the fighting. Celestia Barker's journal (MS 246). These online diaries and reminiscences now allow more people to read perspectives of Iowans who fought in and lived during the Civil War. At the end of his reminiscence, Stone says “As you read please correct what errors you see. I have not patience to do it now, am tired of the thing.” Hopefully his efforts did not go in vain, and can be even more appreciated with the wider audience now made possible with the narrative’s digitization, along with the stories of other Iowans who lived during the Civil War. The Civil War diaries can be found from the Digital Collections homepage. The digitized diaries and narratives are only a portion of Civil War related materials held in Special Collections. Check out our Civil War Subject Guide to find out about our other collections. In addition, if you would like to find out more about the digitized diaries and narratives described above, you can find links from this page of our online finding aids for the Civil War diaries. First page of the narrative portion of the journal. The previous pages contain lists of supplies and people. Recently our department acquired a hunting journal from the 19th century. 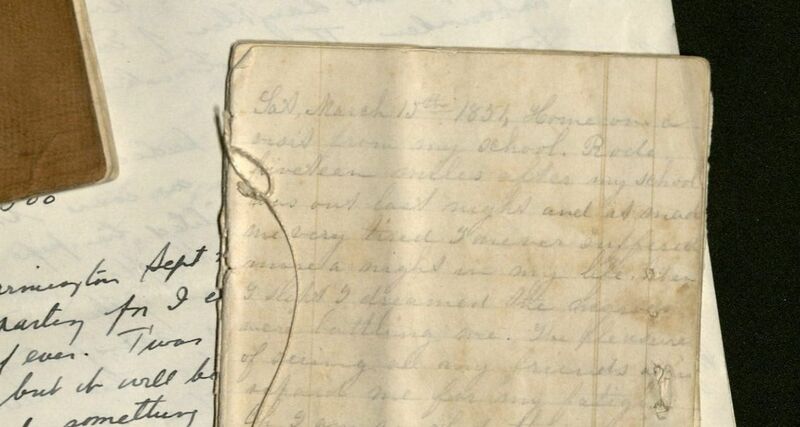 The previous post was written by one of our summer student assistants who was assigned the task of transcribing the penciled, and often very smudged, journal of a hunting trip through northern Iowa, probably in the year 1871. I highly recommend that you read her great description. The finding aid, which gives a more in-depth description of the journal and its contents, can be found on our website. We have also uploaded the transcript and scanned journal. If you try going back and forth from the transcript to the scanned entries, you will see that the page numbers used for the scanned pages do not coincide with those used for the transcript pages. This is because we scanned the two open pages as one scan, but used each individual page for the transcription so that it would better coincide with the pages of the original journal. Hopefully this does not cause too much trouble, and you will not mind brushing up on your multiplication and division skills! When I recently started the processing work to make the journal available for the public, I was very excited to discover that the author and his traveling companions followed a similar route to part of this year’s RAGBRAI, an annual non-competitive bicycle ride across Iowa. As a first time RAGBRAI participant this year, the journal became that much more alive to me since the author of the journal describes the hunting group as starting out in their hometown of Charles City, Iowa and they continue on their way through Clear Lake and Algona – all of which are RAGBRAI stops. They continue slightly northwest to Lost Island Lake, Iowa before turning back. However, unlike RAGBRAI which takes place in the sweltering heat of August, the hunting group traveled in the sometimes rather cold and snowy weather of March and early spring. They obviously did not travel by bicycle, but by horse and possibly wagon since he describes at several points a boat which was also used to haul supplies. Hopefully this year’s bicyclists will not come across any wolves, prairie fires, or blizzards and will be able to find enough sustenance along the way so they will not have to resort to eating “rats” (most likely muskrats). The journal is a fascinating read, and hopefully everyone who tackles it will find some aspect they enjoy. As you will see when reading the finding aid and journal, not much is known about the author. 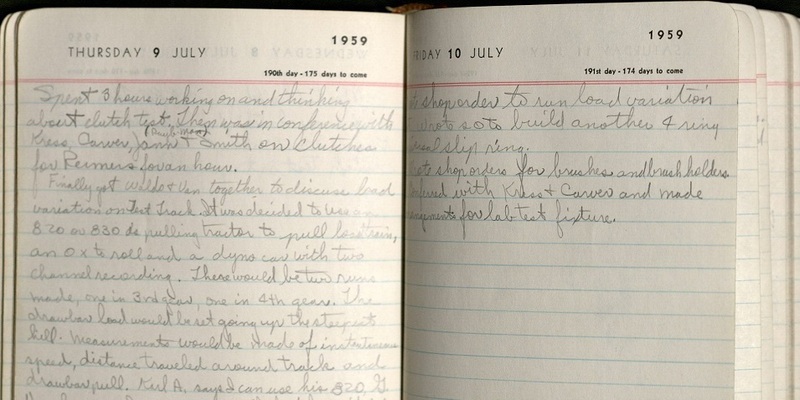 A fellow archivist who grew up in Charles City, Iowa and has connections with the local Floyd County Historical Society, has graciously agreed to do some research to see if he can find anything about the journal’s author or any of his companions. We look forward to learning about what he can find, and if anything is found I will report it back here! Below is a description written by my summer student assistant, Melissa Dickey, on her experience transcribing a recently acquired hunting journal (MS 647). In the near future there will be a post letting everyone know the links for the transcription, journal, and finding aid. Section of the journal in which the author describes a prairie fire (page 38). Over the past few weeks, I have been able to take a walk in someone else’s shoes, or more accurately, their hunting boots. I have been transcribing a journal detailing a hunting trip across northern Iowa. The journal is unsigned so we don’t know the name of the author and it is only dated with the month and day, but by looking up those dates we’ve found that the first entry, Wednesday, March 29, was most likely written in 1871. The journal contains various records of goods bought and sold before the actual entries begin and by comparing the two styles of handwriting, it seems that these preliminary records were kept by someone other than the author of the entries, possibly his wife. The whole process of transcribing was new to me, so I spent some time researching the do’s and don’ts. A pretty obvious rule is to not correct any spelling or grammar mistakes, and believe me, there were plenty in this journal. For a grammar stickler like me, it was hard to resist the urge to hit “spell-check.” Getting used to the author’s unique penmanship also took some time, and I caught many of my early mistakes and mistranslations by occasionally rereading the journal and comparing words. The author almost never crosses his lowercase “t’s”, which sometimes led to a wrong translation if I mistook the letter for an “L”. Also, whenever a word ended with the letter “n”, instead of forming the letter, the author carries his pen stroke out in a straight line from the previous letter. Page from the atlas used to locate Lime Creek. From: Atlas of Cerro Gordo County Iowa. Chicago, IL: Anderson Publishing Company, 1912. 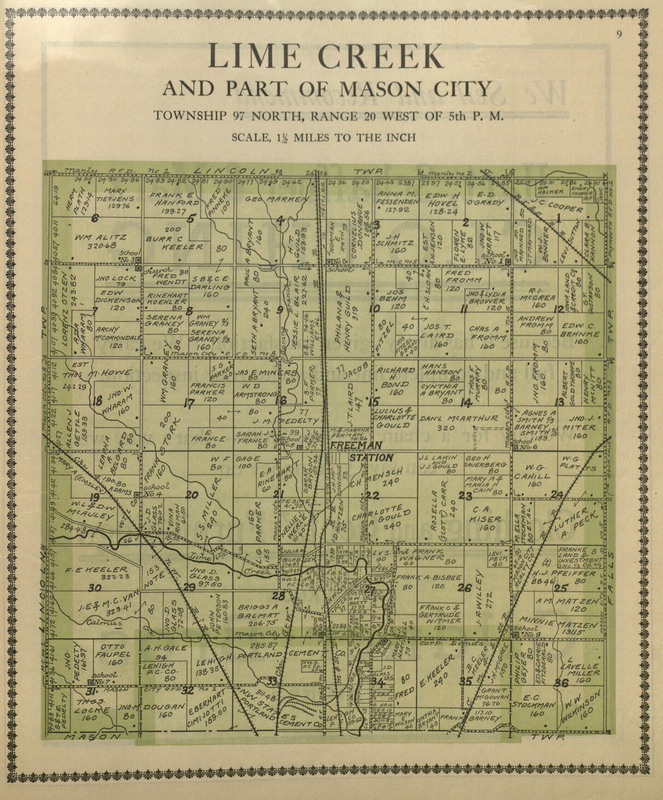 Having only lived in Iowa for a couple of years, I was not familiar with some of the towns and geographical locations mentioned in the journal. One in particular, Lime Creek, I had to double check on, so a co-worker and I looked in an Iowa atlas from the 1870’s, to confirm the name of the creek. It was also helpful to use geographical information to pinpoint where exactly the hunting party was when the author didn’t mention their location, or as was more often the case, overestimated their distance from a town or river. Speaking of distance, while transcribing this journal I noticed that the author kept saying things like “we are twenty rods distant of the town” and at first I thought I was mistranslating again, but after some fun on Google, I found out that a rod was a common measure of distance from the 17th century onward and was equal to 16.5 feet, or the length of a perch or pole, which were also common units of measure in old English. Transcribing can be really fun and rewarding; especially when you finally finish a page you’ve spent a lot of time on. In the case of this hunting journal, it was a nice break from my usual work and a chance to step back more than a hundred years in time and take a walk in someone else’s hunting boots.